This delicious drink can be made from scratch or with a concentrated solution. 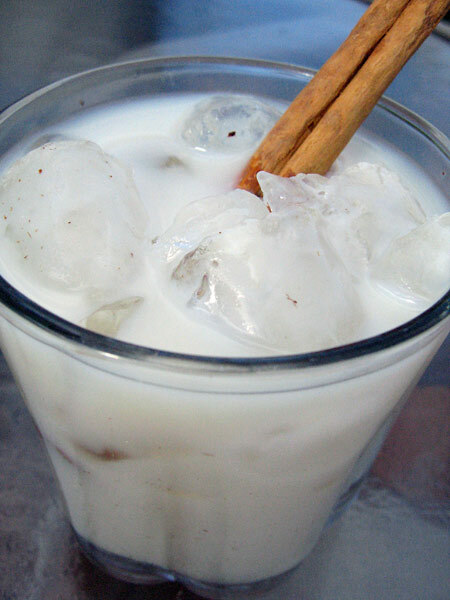 Below are the instructions for the traditional horchata drink, made from scratch. Makes 4 litres. Instructions: A couple of hours beforehand, soak the rice in boiling water, waiting until the water reaches room temperature. In a saucepan, boil 2 cups of water with 4 cinnamon sticks. This will give you a sort of concentrated tea. Let cool. In a blender, add the rice (with its water), the cinnamon tea (with some of the cinnamon) and the vanilla. Blend until smooth. Drain the liquid from the blender onto a pitcher. Add more water (about 3 litres), the sugar (to taste), the milk and mix well. I did not think horchata had “real” milk in it. That’s why I’ve always ordered it in Mexican restaurants.